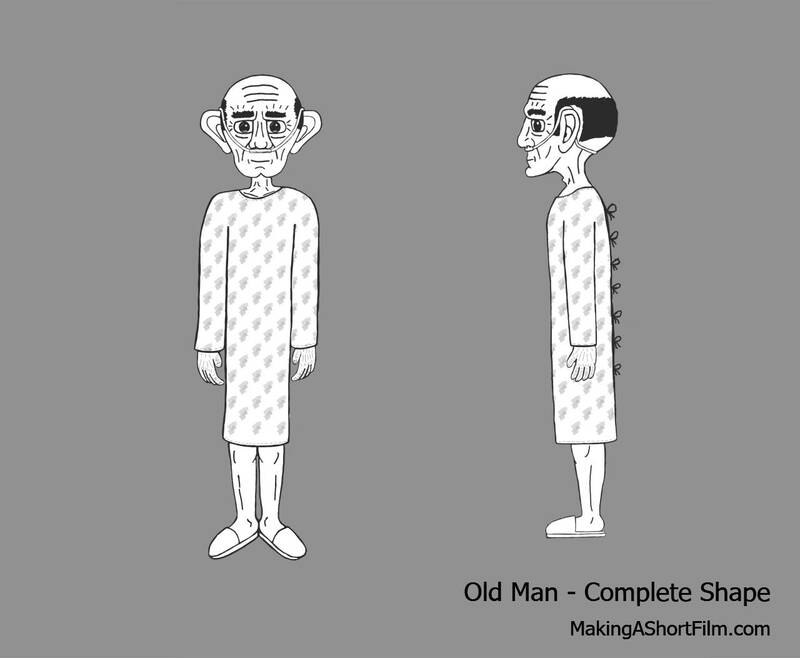 I have continued drawing the Old Man, completing the overall shape and details of the concept art. It ended up very close to the general shape shown in the previous update. That shape was fairly finished and cleaned up already, so few major changes needed to be made. In the face, I only added detail, not adjusting any of the lines I already had. I painted in the nasal oxygen tube the Old Man is relying on to breath properly, as well as gave him wrinkles to try to get a feel for his age and how worn down he is. The wrinkles are very rough at this stage and will be more properly decided later on, both in number and size. Also worth to note is that I gave him some hair. The hair is on the side and back of the head, which is very typical for old men, but it is also the opposite hair placement of the Robot, enhancing their difference. Note that the hair is painted black in these images simply since I keep all the lines the same color at this stage, but as he is an old man, the hair will be white later on. As for the body, the gown was given more details, with a pattern as well as seams and knots. Like most hospital gowns (that I have seen at least) it is solid in the front, with an opening in the back. The legs and feet is the part where the general shape has been changed the most, specifying that he is wearing slippers (really showing that he is not equipped to go outside), and giving him more humanlike legs instead of two straight pipes. Other than that, a major thing added was obviously the presence of a side view. Having both a front and side view will be very helpful later when I will try to replicate this in 3D. As I explained in a previous post though, a 3D model can't be made to match the two images completely at the same time since they are not drawn that precise, so these images will have to be seen as more of guide than absolute blueprints for the modelling phase. Note that this image is the Old Man in the hospital. In the dream sequence in the beginning, he will have a different set of clothing (the type of clothes he used to wear in his everyday life), as well as looking a bit healthier. The aim is to have him slightly less thin in the dream sequence, making him look well and happy. Then when switching to the hospital scene, his worsened condition will become apparent simply from his weight loss, as well as paler skin. The next step is now to shade him to get a better feel for the actual roundness and shape of everything (just as I did with the Robot). See you then!